While creating a keepsake for the recent exhibition at Ditchling, I realised that this is the eightieth anniversary of the Elizabeth typeface being completely available from the Bauer Foundry in Frankfurt. 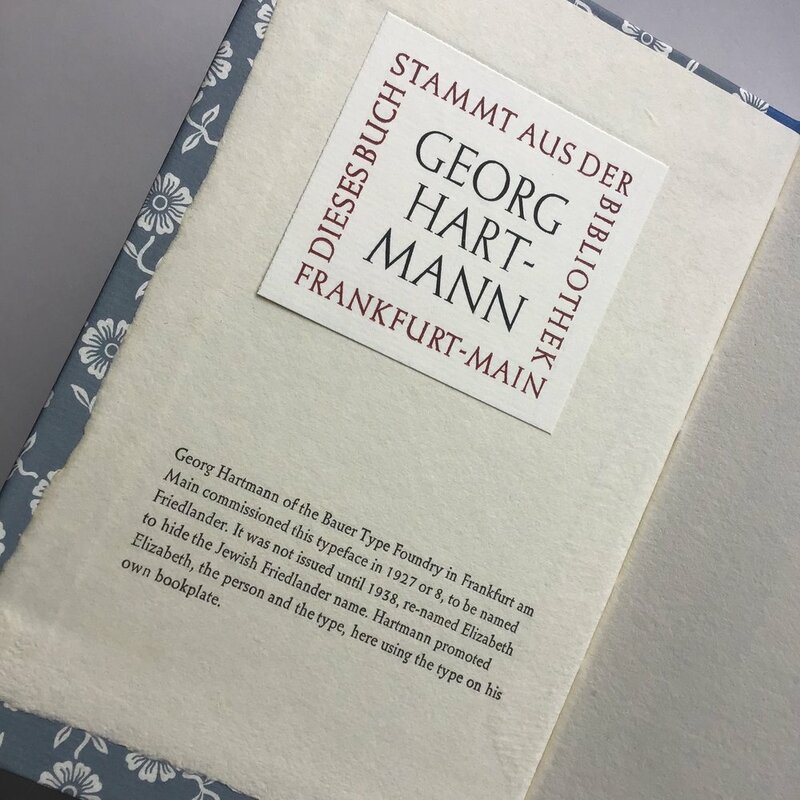 Georg Hartmann, the owner, had commissioned the design some ten or eleven years before from Elizabeth Friedlander, recently out of art school in Berlin and working as a headline calligrapher for the women’s magazine Die Dame. A celebratory book was called for, so I re-read our 1999 book about Friedlander’s work, Pauline Paucker’s excellent New Borders, a book that had quickly gone out of print. When this was published we had no cases of Elizabeth type at Incline Press, but in the intervening years have managed to purchase a few sizes, some of which had recently been used on merchandise for the shop at Ditchling Museum. We unearthed a few of our 1999 magnesium plates and sourced some of her original Curwen patterned papers from John Purcell Paper: this book is the result. It’s a thumbnail sketch of her career from Germany to a working exile first in Italy and then England, and finally to retirement in Ireland. New Borders tells the story properly but that is a difficult book to find now, so this more simple jeu d’esprit may serve as something of a guide to those who wish to dig deeper. The delightful exhibition curated by Katharine Meynell at Ditchling is over. Friedlander’s beautiful calligraphic book that she created for Francis Meynell is back at home on the shelf, and the material loaned by Cork University’s Boole Library is back in the archive. We can but hope that before another twenty years has passed there is more interest and another exhibition. Her work is much more than a footnote, and her story is more than her work. 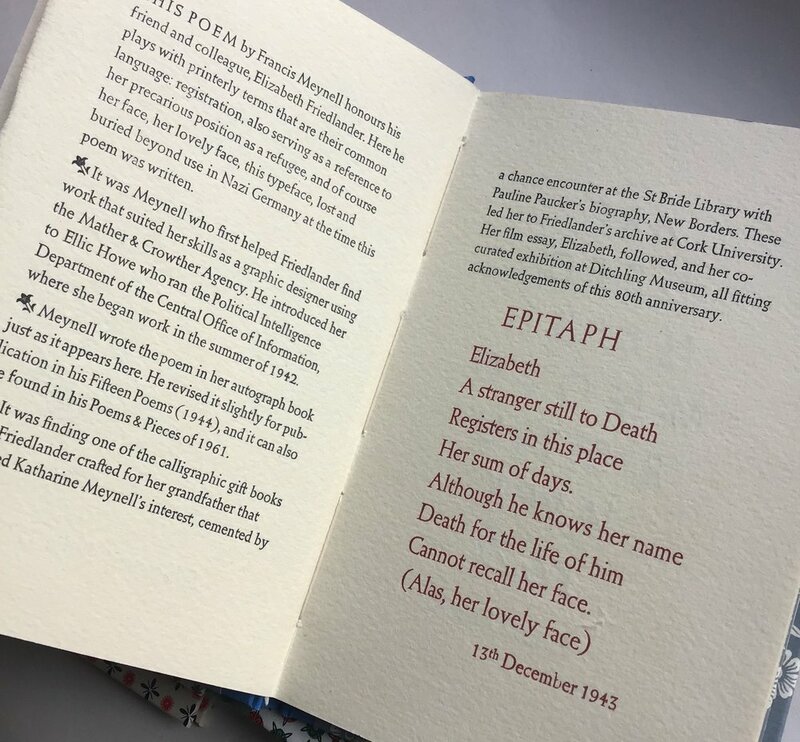 Elizabeth at Eighty is printed in an edition of less that 120 copies on Wookey Hole paper that was made by hand back when E*F was still alive. Some type was damaged in the making of this book! If you look closely at these photos of the text you will see that there are some broken letters. This was caused by slubs in the paper, so only affects some copies. Each book is bound in one of her Curwen papers; double-page samples of all five are in each copy. Please don't try to specify which of the five you would like, as that would truly be a rod for my back! They are all wonderful so pot luck is your pleasant surprise! Publishing handmade books is a process rather than an event, so copies will slowly come from us through the months of May and June. The price is £45 each, less a £5 discount for those who pre-pay with their order in the month of May. Go to the SHOP by clicking on the image above.